I guess scrubbing the bathroom and mopping three rooms of tile floor wasn’t enough to square me with the master of the house for my stay. Before I sneak out of town tomorrow morning, one last item was on the agenda to fulfill my indentured servitude. It was a wash and wax of Mr. Dave’s chariot. Doesn’t sound so bad does it? But there’s always a catch. 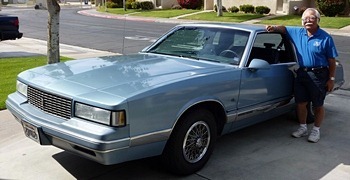 His ride a 1988 Chevrolet Monte Carlo Luxury Sport with more outer body real-estate than a Budweiser beer truck. Luckily, I paced myself. To be fair, no arm-twisting was required. It was my altruistic personality that insisted. This entry was posted on Monday, April 2nd, 2012 at 8:26 pm and is filed under Uncategorized. You can follow any responses to this entry through the RSS 2.0 feed. You can leave a response, or trackback from your own site. Dave is a tough taskmaster! Hey everyone! Scoreboard Paul coming out of retirement! Jamie Farr and Williamsburg 2012! waiting to catch up with all the friends I’ve made over the years! See ya all this summer! the lemon drop kid is back. it will be good to see you. yea baby, but no lemon drops for me anymore!